Are you a member of a Futsal San Jose Team? If so, this is the place to go! Futsal San Jose has confirmed with the commissioner of the Blossom Valley Athletic League (BVAL) that futsal is not recognized as soccer by the California Interscholastic Federation (CIF) or the BVAL. 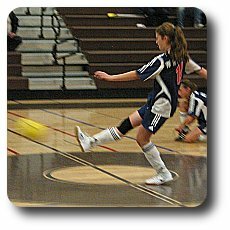 Therefore, high school soccer players may participating in futsal during the high school soccer season (in other words, there's no conflict with CIF Rule 600). However, players should check with their coaches to see if they have any restrictions on players participating in outside sports during the season. All our games will be played on Saturdays and Sundays in one of our gyms. The schedule for all the games is available on our Schedule Page page. Please check our 'Laws of the game' page for local rules.